A new pacemaker device has been developed to operate without a battery and uses the body's movement as a source of energy (piezoelectricity). The beating or contraction of the heart is caused by electrical impulses. These impulses are created naturally by the heart's pacemaker cells called the sinoatrial node (SA Node) located at the right atrium of the heart. They regulate the rhythmic beating of the heart (heart rate). The normal heart rate is 60 to 80 beats a minute. All of the cells within the heart can generate electrical impulses that trigger the heart's contractions but it is the SA Node that initiates the process. This is so because the SA Node generates the impulses faster than the other heart cells that also have this ability. When the sinoatrial node is not fast enough to regulate the heart rate or when the electrical impulses does not stimulate enough for the heart to beat, an artificial pacemaker is surgically inserted to assist in regulating the heart rate. The pacemaker monitors the heart's natural electrical rhythm and when it does not detect a heartbeat within the normal rate, it stimulates it by emitting its own electrical impulse. The pacemaker constantly monitors this and steps in whenever the beat to beat rate goes under. The pacemaker is surgically inserted in the left shoulder area below the collar bone (see image). Leads that transmit the impulses are inserted into the heart through the veins. The Right Ventricular lead would be positioned away from the apex (tip) of the right ventricle and up on the inter ventricular septum, below the outflow tract, to prevent deterioration of the strength of the heart. Most pacemakers are made of titanium and designed so that the body does not reject the device. The device is hermetically sealed and contains a battery (usually a lithium ion battery) as its power source. Batteries in pacemakers usually lasts 5 to 10 years. 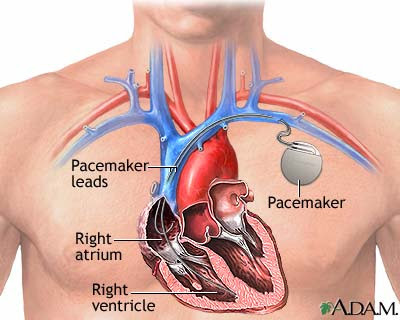 Pacemakers with more advanced functions (such as a built-in defibrillator) lasts shorter since it consumes more power. Once the battery has spent all of its electrical energy, the pacemaker is surgically removed and replaced with a new one. An experimental device converted energy from a beating heart to provide enough electricity to power a pacemaker, in a study (Abstract 15551: Vibration Powered Cardiac Rhythm Devices) presented at the American Heart Association's Scientific Sessions 2012. In a preliminary study, researchers tested an energy-harvesting device that uses piezoelectricity — electrical charge generated from motion. The approach is a promising technological solution for pacemakers, because they require only small amounts of power to operate, said M. Amin Karami, Ph.D., lead author of the study and research fellow in the Department of Aerospace Engineering at the University of Michigan in Ann Arbor. In contrast, a nonlinear harvester — the type used in the study — uses magnets to enhance power production and make the harvester less sensitive to heart rate changes. The nonlinear harvester generated enough power from heartbeats ranging from 20 to 600 beats per minute to continuously power a pacemaker. Devices such as cell phones or microwave ovens would not affect the nonlinear device, Karami said.